Nestled in the Foothills of the Rocky Mountains, a gorgeous Post and Beam Mountain Retreat awaits. This 3 Bedroom, 3 Bath, 2709 sq ft home is filled with western character. 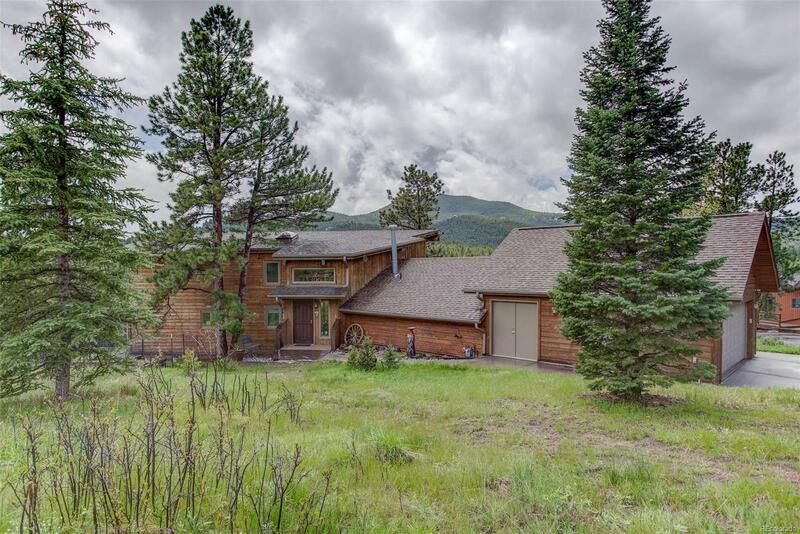 Features include; knotty pine wood paneling, T&G vaulted wood ceilings, warm oak flooring, a moss rock wood burning fireplace, & a living room framed by tall windows with views of Double Header Mountain. Start your day, in the cozy breakfast nook with Bay Window while sipping your coffee & enjoying the views and wild life visits. Completing the main floor are 2 nice size bedrooms, 1 with an en-suite bath, a country kitchen with dining area, a 3/4 bath & main floor laundry. Upstairs you'll find a loft overlooking the Living room & a welcoming Master Suite with an en-suite 5 piece bath. Car Collectors or RV Owners will delight in the detached 5 car heated barn with over-sized doors & wood shop/craft room. This is a Great home in a great Location! Private, Quiet, with an easy commute.